Do you sometimes find it difficult to forgive yourself or others? Do you have baggage from your past that’s stopping you from living your future? 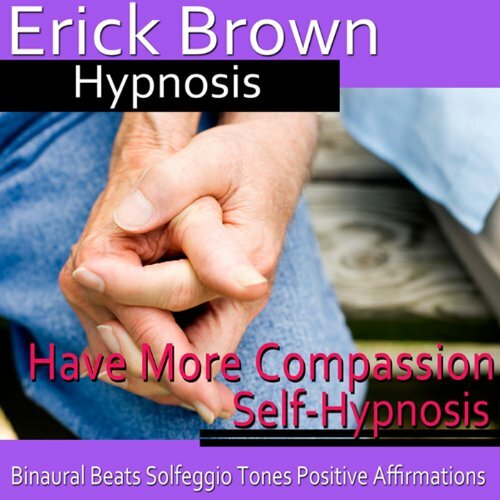 Let go of emotional weight and embrace compassion for yourself and others with the help of this hypnosis program from Erick Brown. Let Have More Compassion help you release from negative and defeating thoughts, and embrace love, kindness, and forgiveness. Suggestions for deep relaxation and positive change will be received by your subconscious, increasing your self-esteem, building more patience, and promoting kindness towards yourself and others. Why wait another day? You can release the past and embrace positivity and love today. Have More Compassion includes an instructional track and three hypnosis tracks for you to choose from: One containing a beach induction that will lull you into a deep state of relaxation with the soothing sounds of waves hitting the shore, allowing you to let go of any mental inhibitions and be completely open to positive change; one containing a staircase induction that will walk you down a mental stairway into a deeply relaxed state that ends with you in a peaceful, safe place where you can feel comfortable enough to completely open up to these hypnotic suggestions; and, one containing a speed induction that will quickly take you into a deeply relaxed state. Use this track if you are already familiar with the relaxation process and would like to quickly move into deep relaxation. Bonus Track: Deep Sleep Subliminal -This subliminal bonus track can be used with your hypnosis program or on its own for a deep, restful sleep. Binaural beats and solfeggio tones relax your brainwaves and body, melting away tension and stress.